You are currently browsing the tag archive for the ‘breast cancer awareness’ tag. 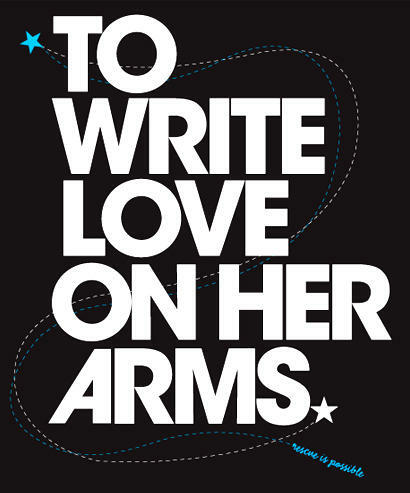 To Write Love on Her Arms is a “non-profit movement dedicated to presenting hope and finding help for people struggling with depression, addiction, self-injury and suicide.” They exist “to encourage, inform, inspire and also to invest directly into treatment and recovery.” What’s funny is that I’m just now finding out about them, despite the fact that I’ve been in and out of therapy for depression for about a decade now. I appreciate their general message, which is, “You were created to love and be loved. You were meant to live life in relationship with other people, to know and be known. You need to know that your story is important and that you’re part of a bigger story. You need to know that your life matters.” That’s great. I’d love to hear that coming from an actual person who cared about me. But how do they go about facilitating and spreading this message (assuming that they do at all, considering that I never heard a thing about it)? Well, I know they sell merchandise, so you can buy a shirt that says, “I care about your depression,” basically. In fact, this is how the organization began, with a group of kids selling shirts to raise money to get therapy for a friend who was struggling with some mental issues. I think that’s awesome, too.